Will Royal Wedding Include Life-Size Kate & William Cake Sculpture? It was really a challenge for me to do this cake. It's a hard work, but I really enjoyed making it. Prince William and Kate Middleton cake is made of traditional english fruit cake, carved into 3D busts with an armature inside, covered with apricot jam. The icing was sculpted with details and then airbrushed with colours to make it look more realistic. It took about 80 hours to make and I uses more than 10kgs marzipan and 10kg Icing sugar. This is probably too out there for the royals, but it will undoubtedly inspire other brides. 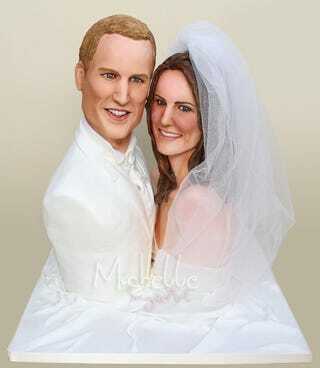 Nothing says romance like slicing into an elaborate cake sculpture of the happy couple's faces.